Biosoluble Gaskets+Fiberglass---HPB12G Biosoluble Fiber Twist Insulation Gaskets With Fiberglass Filament Reinforcement--Shanghai Hoprime Industrial Co., Ltd.
HPB12G Biosoluble Fiber Twist Insulation Gaskets With Fiberglass Filament Reinforcement are made of our high quality ceramic fiber yarns which are made of bio-soluble fiber imported from unifrax. They can be used for high temperature applications up to 1000℃. 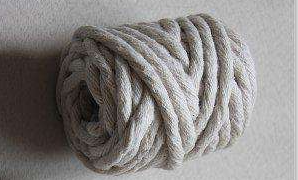 The rope is reinforced with fiberglass filament.It contains a certain amount of binder material which is normally burned at lower temperature and does not affect the insulation property.